I feel like I’m cheating on ranch a little as I write this post. If you know anything about me, it’s that I could put ranch on anything and everything (pizza, fries, salads, wraps, tacos…really, anything!). If Nick would have let me, I probably would have had a ranch fountain at our wedding, ha! Although I love ranch so much, sometimes a classic caesar dressing is so good. And let me tell you, this salad is good! The dressing is so easy to make and I think it tastes much better than the store bought stuff. Back to the ranch convo–let’s be clear, Hidden Valley does NOT make the cut for me. 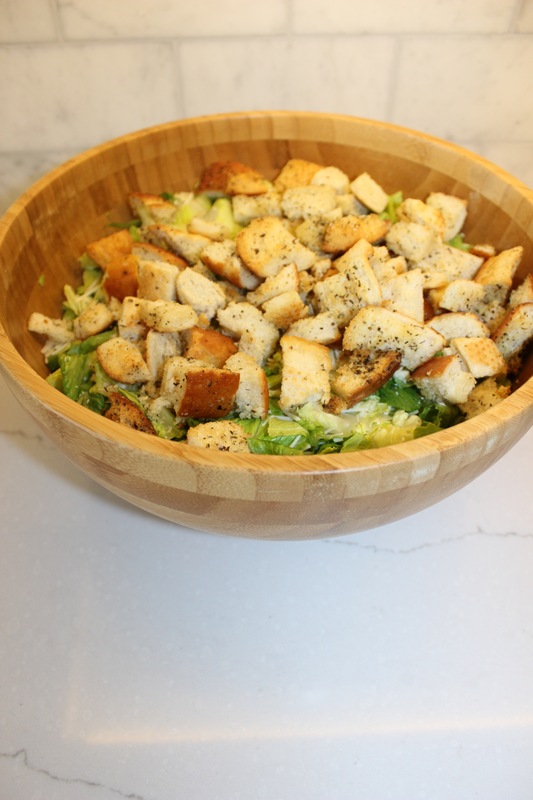 Anyway, when you add parmesan and homemade croutons to the caesar salad, I’m sold! The dressing comes together in 10 minutes or less and the homemade croutons add such a fancy touch but are so easy to make. My sister, being the fabulous cook that she is (I think I’ve seen her make like 10 meals in my entire life), gave me this crouton recipe. All jokes aside, my sister rarely cooks (thank goodness she married someone who likes to!) but when she does, it’s always so good! Cut bread into cubes and place in a large bowl. Drizzle cubes with olive oil, salt, pepper, Italian seasoning, and garlic powder. You’ll want to generously coat them in seasoning. Add Parmesan cheese if desired. Mix well. Cover a cookie sheet with foil or parchment paper. Spread seasoned bread onto the cookie sheet and bake for about 20 minutes or until bread cubes are browned. **Note: Croutons can be stored in a covered container or plastic bag for up to one day or in the freezer for up to 6 months. Right before serving mix salad, parmesan cheese, dressing, and croutons together & serve!